Buy coins. The easiest and safest method of investing in gold and silver is to buy coins minted from pure metals. Franklin Sanders explains in his article "The Ten Commandments of Gold & Silver Buying" that quarters, dimes and half dollars minted in the United States before 1965 contain 90 percent pure silver, or 0.715 troy ounces. Although alloyed with other metals, these coins contain enough silver to make them worthwhile investments, and they are relatively easy to acquire. While gold coins were not frequently produced for mass circulation, significant quantities exist containing enough gold to make them valuable investments. Buy bullion. While bullion is more difficult to acquire, bars of gold and silver are sometimes considered a better method of investing in these metals. 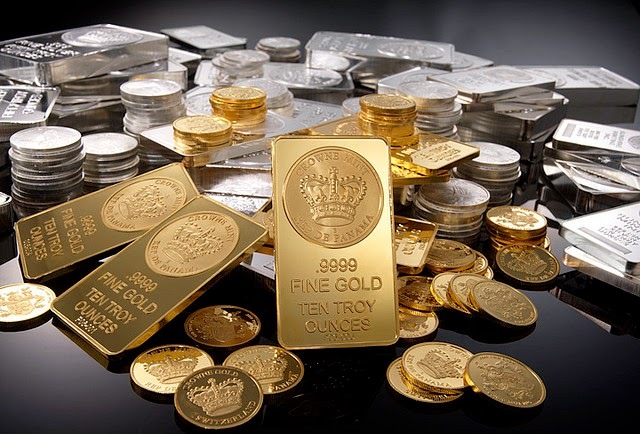 Bullion contains 99 percent pure gold or silver, and is therefore not subject to the fluctuations sometimes associated with coins issued by various governments around the world. However, as Jason Hamlin explains, "Buying physical gold and silver gives the owner definite possession, but comes with high premiums and the necessity to store and protect the metal." Buy precious metals mutual funds. You can indirectly invest in gold and silver by purchasing mutual funds or ETFs that invest the bulk of the fund's assets in tangible coins and bullion, and other types of companies involved in the mining and production of gold or silver. With this type of investment, you do not actually own any of the gold or silver, but still participate in the industry's fluctuations. Buying metals funds requires significantly less involvement and responsibility, and appeals to investors more interested in profiting from the precious metals market as opposed to actually possessing the metals themselves. Buy mining company stocks. Like investing in precious metals mutual funds, buying stock in gold or silver mining companies does not bring you tangible gold or silver. Instead, buying such stocks allows you to participate in the increasing value of a mining operation producing significant quantities of gold and silver. However, in his February 2011 article "How to Invest in Gold," Alix Steel explains "Many investors make the mistake of buying small gold miners that are in the exploration phase with no cash flow." He likens this to buying lottery tickets and states that most start-up precious metals mining operations fail, and later goes on to explain that only a very small number of mining stocks are worth buying. Store your coins or bullion in a safe place. Find a way to protect your investment from dangers like theft, flood or fire. Consider opening a safe deposit box at your local bank, which provides maximum protection from burglary and the elements. Carefully evaluate any precious metals fund or stock before you invest any money. Making a mistake could prove costly, especially since this method of investing yields no tangible assets. Carefully choose a gold or silver dealer to provide you with coins and bullion, and avoid numismatic or "collectors'" coins.